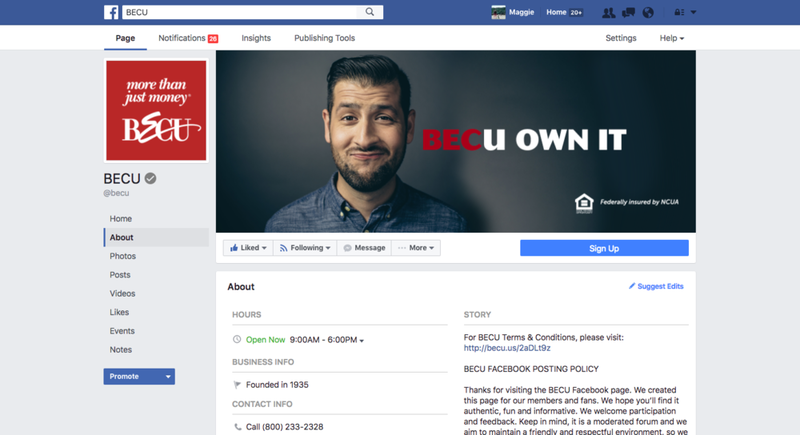 I started as the copywriter on the creative team at BECU in April 2016—right around the time that this local credit union hired a full-time social media manager. 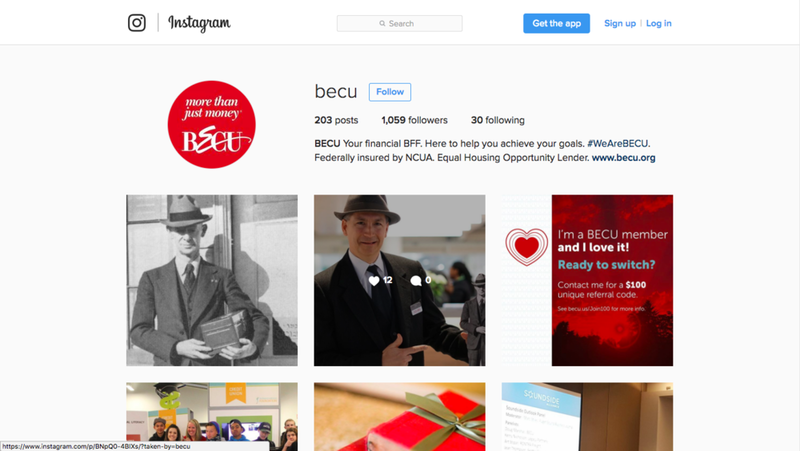 The creative team and social media team have been working closely together to improve BECU's social media presence. I work on content strategy and social branding, concept ideas for campaigns, write copy daily, and work with graphic designers to come up fun, eye-catching graphics that will stand out on our members' newsfeeds. Your financial BFF. Here to help. Member care from 7am–7pm M–F & 9am–1pm Sat. One of the first things we did was update BECU's social profiles. Before, cover images were disconnected across platforms. Now, they're aligned with our 2016 campaign—which has a strong brand message about members owning the credit union. To accompany this snappy look, we updated our "about us" across Facebook, Instagram, Twitter, LinkedIn, and Glassdoor. Each varies slightly to be appropriate for the platform. My two favorite are Instagram and Twitter. I like the description I wrote for Instagram because it's so this day and age. For Twitter, I highlighted the fact that BECU's amazing member care team responds provides great customer service on the platform—they're fast, friendly and oh-so-accurate. Our member referral campaign traditionally goes out over email. 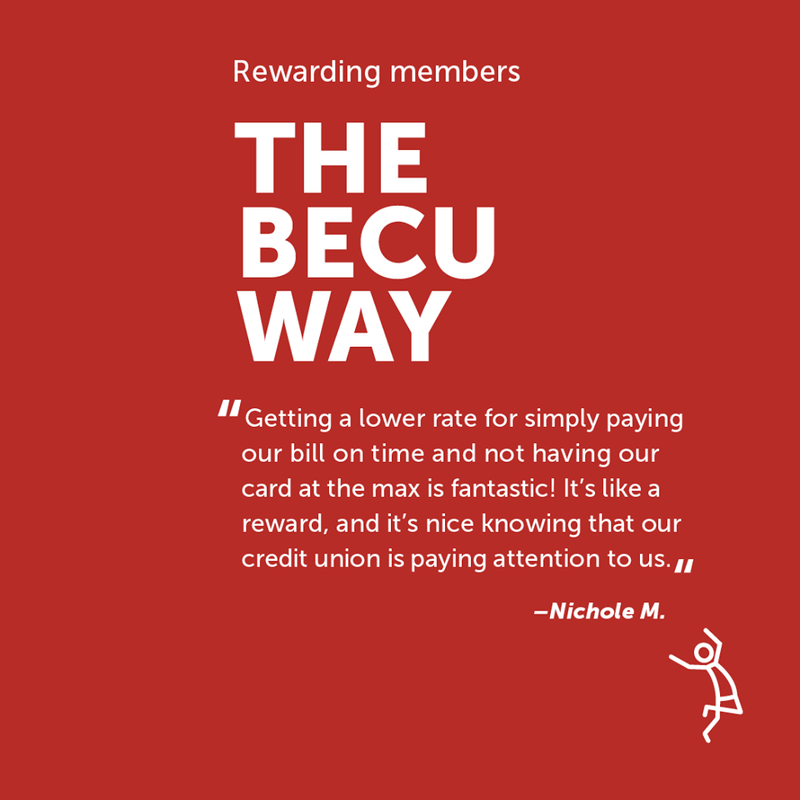 This year, I pitched the idea of adding a social graphic—something members could share with their friends to let them know about the offer and spread the word about how much they love BECU. 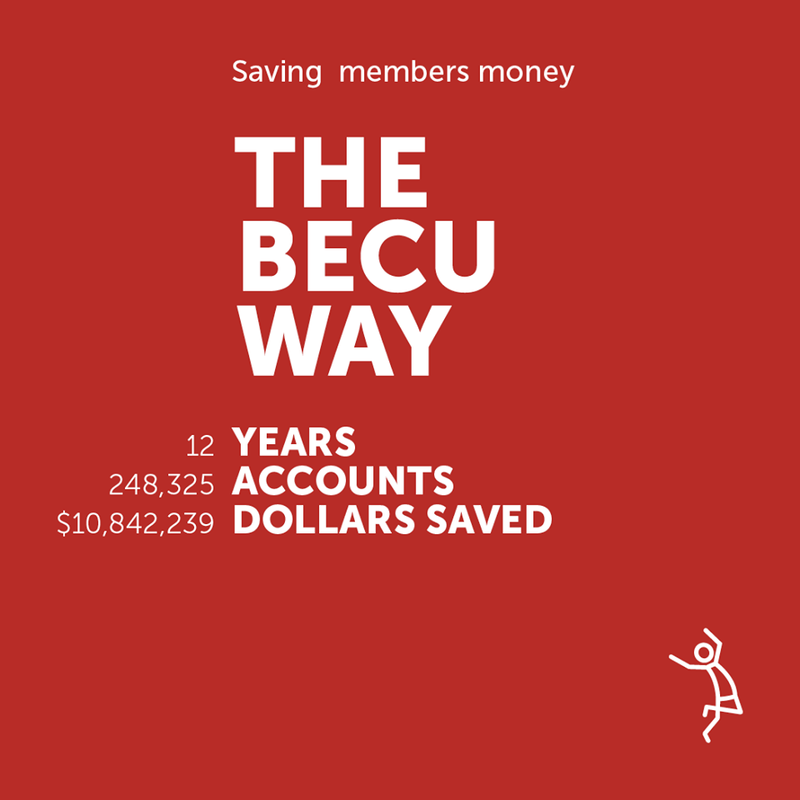 We know that members love BECU—but so far, we haven't seen much of that love on social. To be fair—do you walk around bragging on your credit union on social media? Finances feel personal, man! Don't ask me to talk about that stuff on the Internet! So far, this simple shout-out is one of our most shared social posts ever. 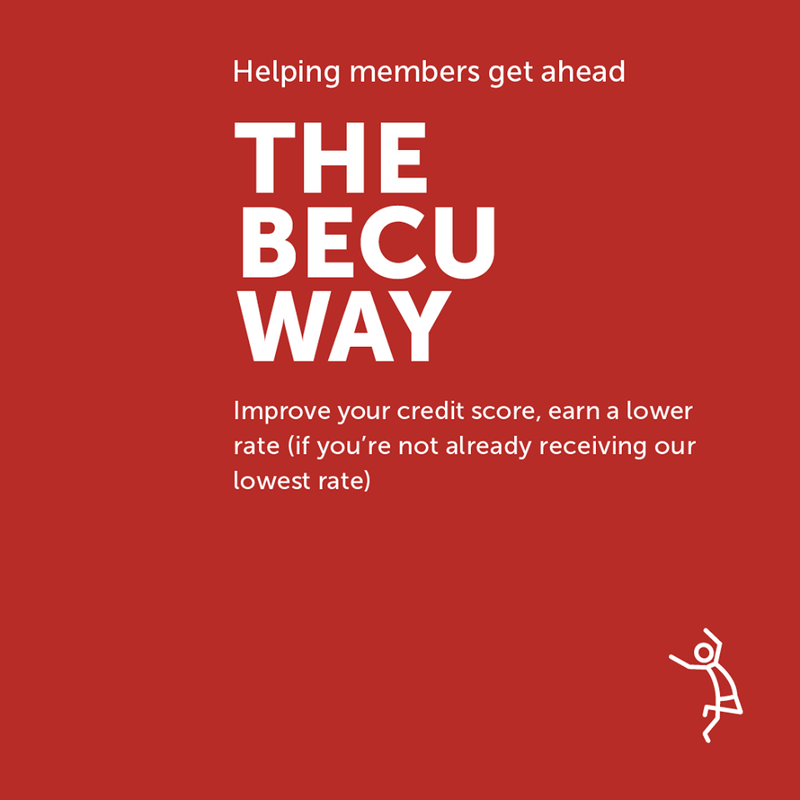 Each year, BECU reviews our members' accounts for money-saving opportunities. If they've improved their credit score, they may earn lower rates on credit cards; auto, boat or RV loans; personal loans and lines of credit. It's a pretty amazing program that saves members thousands of dollars a year—which adds up like nobody's business. I worked with our designers to create a direct mail piece that celebrated with our members and congratulated them on their achievement. We added a social component: branded graphics that capture the spirit of this program so we could share the good news. Charmingly, our members were doing the same thing at the same time—sharing the good news of their savings as their congratulatory package hit their mailboxes. I wrote a blog post about BECU's top 7 tips for keeping yourself online, a LinkedIn blog post for our VP to publish on his own profile, and then we tried something new for social media: we created our first ever gifs. 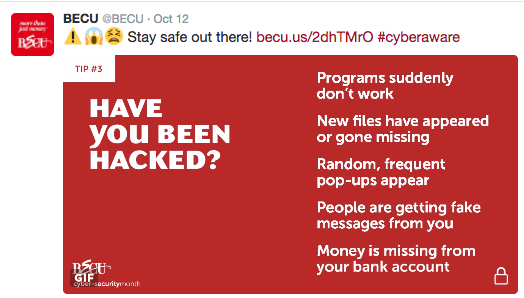 We played it (mostly) straight, because cyber-security is no joking matter—and because our main aim was not to entertain, but to educate. Improving your online security is at the top of people's to-do lists right after going to the dentist. 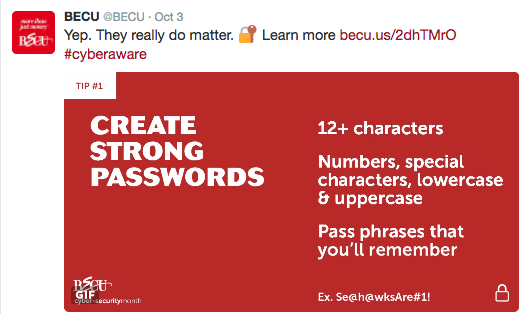 In an amazing moment of insight, our VP of Information Security just happened to say you should treat passwords like toothbrushes: Don't share them. Change them frequently.